French grammar includes a variety of indefinite and impersonal constructions, and one of the most important of these is the third person indefinite stressed pronoun soi. Because it doesn’t have a straightforward English equivalent, soi is commonly misused by French students, who confuse it with lui. Soi is used like other stressed pronouns: for emphasis. What makes soi unique is that it’s used only for indefinite, unspecified persons; that is, when speaking in generalities and with indefinite pronouns and impersonal verbs. On va rester chez soi. We’re (all) going to stay home (in our own homes). Il est important d’être soi. It’s important to be yourself/oneself. Il faut regarder devant soi. It’s necessary to look ahead. Cela va de soi. That is self evident, That goes without saying. 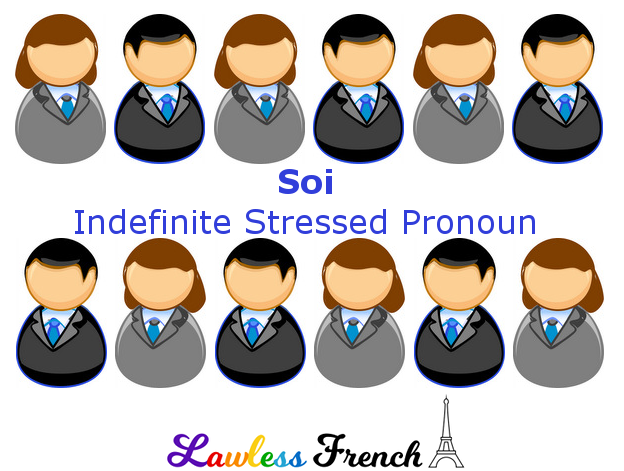 The emphatic stressed pronoun soi-même is likewise used only for generalities, indefinites, and impersonal constructions. Il est important d’avoir le respect de soi-même. It’s important to have self-respect. Il ne faut jamais pitoyer soi-même. One should never feel sorry for oneself. Tout le monde travaille pour soi-même. Everyone works for themselves. 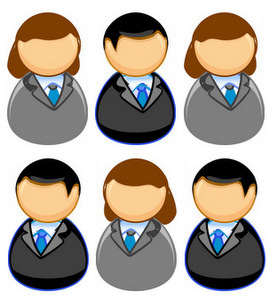 In contrast to the above, lui and lui-même are used only for specific people. Il reste chez lui. He’s staying at (his own) home. Pierre ne regarde pas devant lui. Pierre isn’t looking ahead. Thomas a le respect de lui-même. Thomas has self-respect. Mon fils travaille pour lui-même. My son works for himself. When on is used as an informal equivalent for nous – and is therefore not impersonal – the stressed pronoun is typically nous rather than soi. On doit le faire soi-même. Everyone has to do it him/herself. On doit le faire nous-mêmes. We have to do it ourselves.